The international community has generated several hundred multilateral environmental agreements, yet it has been far less successful in developing means to ensure that contracting parties honour them in practice. The subject of law enforcement has traditionally attracted relatively little attention amongst international policy-makers at the formation stage of a multilateral environmental accord. Commonly, the question of how to secure collective adherence to environmental treaty regimes might well only be considered in depth at a much later stage of an environmental agreement’s evolution, if at all. At the same time, the significance of the issue of enforcement has gradually received more considered attention by states and international institutions. 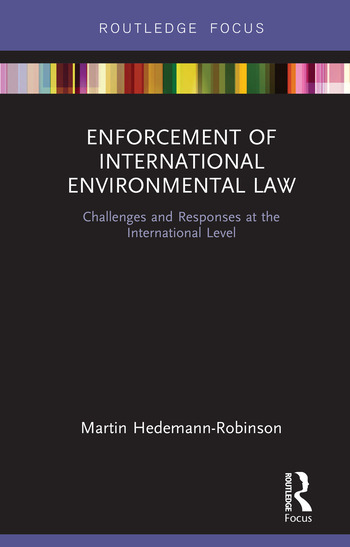 Providing an analysis of the nature, extent and current state of the international legal framework concerned with enhancing effective implementation of international environmental law, this book considers the scope and impact of international rules of law whose remit is to require or promote compliance by states with their international environmental legal obligations. Dr Martin Hedemann-Robinson is a Senior Lecturer in Law at the University of Kent, UK, and a former legal administrator of the European Commission.